A thief may outright, break into someone’s home and steal. A burglar is a sophisticated type of thief. He oftentimes accomplishes (or attempts to accomplish) his thievery by stealth, under the cover of darkness. An extortioner is much like an accomplished burglar. He or she often is a “white collar” thief, utilizing fanciful means and methods to lift other people’s monies and wealth. Sometimes this is accomplished through disreputable (cloaked) accounting, and other financial methods. 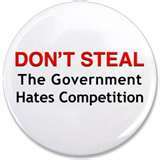 Political extortion is by far the most subtle and sophisticated form of thievery. It is also the slimiest. And, its widespread political practice, (at least in this life) enjoys a type of "legalized" status. Politicians (unless appointed by their peers), are elected by the general public to serve the peoples' bests interests. They, (the politicians) are generally (though less frequently) referred to, as “public ‘servants.’” As public servants, part of their elected office requires them to make monetary decisions. Decisions that are made, by these representative elected officials, require the dispensing of public (tax) monies to accomplish the various tasks (decisions) that have been made. Having thus stated, -- “political extortion” is the nefarious practice of handling hard earned taxpayer monies and utilizing them in such a manner, as to insult the givers of those monies who had entrusted those monies to those public servants, for their, (the publics') best interests. Political extortion is to grab these public monies and run with them. “Run” with that money to feed the insatiable and greedy desires of various pet projects and special interest groups, (at the expense and need of the general taxpaying public). This type of (thuggish) thievery snatches tax monies from the supplying source and supplants it elsewhere, to the demise and detriment of those from whom it was lifted. 1. To draw from by force or compulsion; to wrest or wring from by physical force, by menace, duress, violence, authority, or by an illegal means. Conquerors extort contributions from the vanquished; tyrannical princes extort money from their subjects; officers often extort illegal fees; confessions of guilt are extorted by the rack. A promise extorted by duress is not binding. 2. To gain by violence or oppression. The sad fact is, that some politicians often use their elected authority to (consciously or unconsciously) extort (steal) from the very people who put (or appointed) them into office! Could this then be considered, the “unkindest cut?” Surely from God’s point of view! Why did the Good Lord include the sanction against thievery -- “You shall not steal” [Exodus 20:15] in one of the Ten Commandments? It is for a very good purpose. The Scripture’s statement in Proverbs 14:31, - "He who oppresses the poor, reproaches his Maker...." - is to be taken very seriously. Extorting (also) from the less than well to do, the needy and the poor, is a grave sin before the Almighty! It is a grievous action that insults God Himself – so much so, that He excludes from His holy heaven those who live a life [lifestyle] of extortion! Zacchaeus was intent to make restoration to those he cheated, as evidence of genuine repentance and conversion.